Products I'm swooning over for the Month of July 2012! I'm planing on a trip in a couple of days and naturally I'm concerned about Delta losing my luggage again for hte third time in 4 years. I discovered this amazing site that will ensure my luggage doesn't end up in Miami under Luggage war. Have you seen the show? hilarious right? Our tough TRACE ME tag provides airlines, train operators, the police and even local transport companies with the facility to securely identify your luggage and immediately notify you how to retrieve it from anywhere in the world. 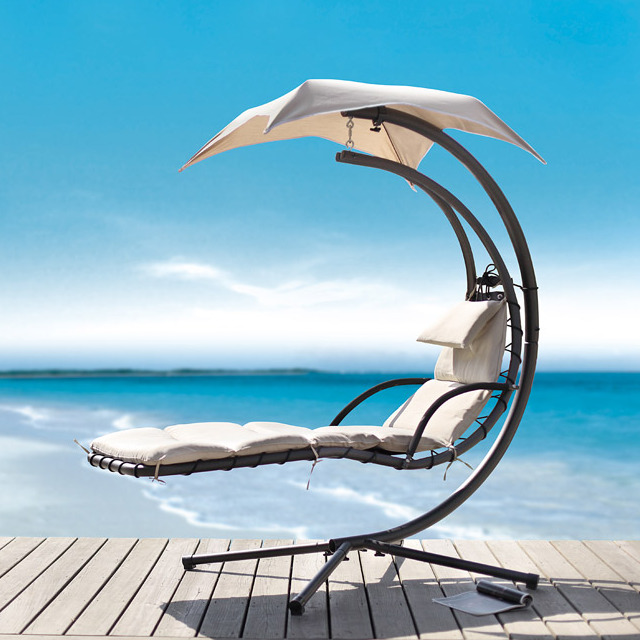 Delano Dream Chair Chaise Lounge Patio Furniture by RST Outdoor is the pinnacle of outdoor style and comfort. 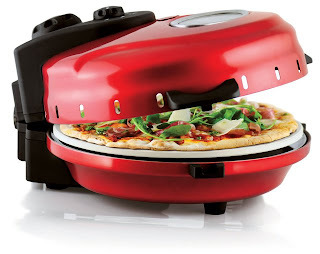 Try this version of the ingenius Pizza Scissors instead! 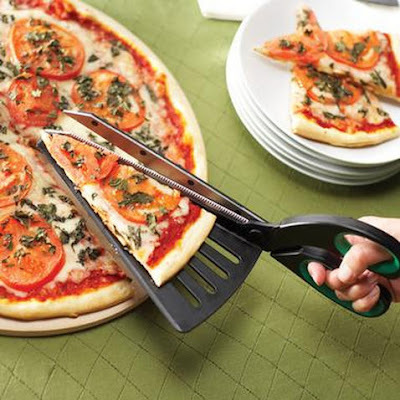 The Dreamfarm Scizza 12-Inch Pizza Scissors. Scizza's unique spatula tip slides easily under food. This stainless steel counter top pizza oven from E-Ware features a nonstick rotating pan that spins even frozen pizza into a bubbling hot pie. This counter top appliance has an adjustable cooking timer and a transparent window. 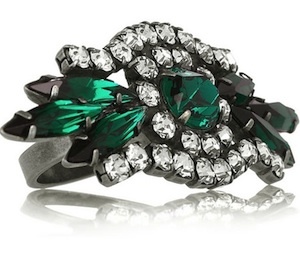 What are swooning over this month? I was looking at all the Fall 2012 fashion shows from the trendiest fashion houses, and found a number of the shows features clutches for Fall and Winter. As cute as they are I will never be able to afford not even the simplest clutch at $821.00. What is a girl to do in that situation? I’m glad you asked because as crafters there’s always a way to do something fun, creative by using what we have. Today I’m going to show you how you can create one not even for $15.00 or 10.00 dollars, are you ready for this? $5.00. yep you read it right just $5.00. This will make an awesome Christmas gift as well. This was my inspiration @$821.00. Remove any sticker from the napkin, spray with the Scotch sealant let dry for 30 minutes. It will keep the clutch from getting dirty too fast. Fold the napkin in 1/3 like below on the wrong side. Stitch each side, then turn inside out. Sew button by hand to the top flap, attached Velcro under the flap to top of flap and bottom to keep the clutch close. Voila done, a trendy clutch for under $5.00. I hope you had a great fourth of July. I've been sick with the flu, I've had no energy, let alone to be cooking. However there's nothing better than a twice bake potato to fill you up. You can get very creative with the toppings on a potato from adding salsa, bacon, cheddar cheese, and even shrimps. What's your favorite toppings for potatoes? Boil the potatoes add kosher salt for 20 mtes. Remove from heat. In a bowl mix the garlic, oil, black pepper,smoke salt,rosemary. 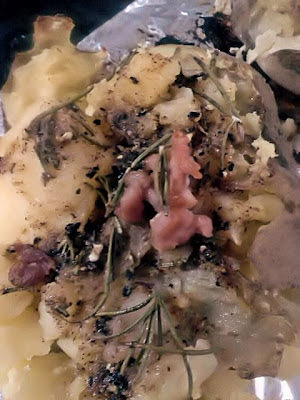 Arrange all 4 potatoes on the cookie sheet smash a bit, add the oil mixture to the top of the potato, add the dice bacon. Bake for 5 mtes at 350 degrees. 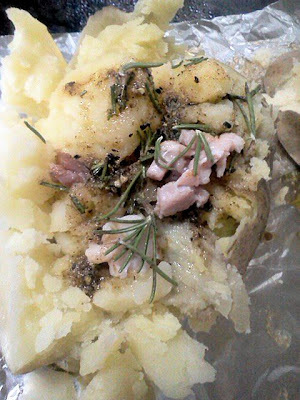 Voila your bake potato should like this. yum I can assure you it's very tasty and filling! Best chicken pasta salad ever! It’s almost 4th of July tomorrow, what are your meals plans? When it’s hot outside the last thing I want to do is spend hours cooking, my best go to dish is a simple pasta salad with chicken. The best simple dish ever! Boil water according to package direction. Drain mix in the pesto to the cook pasta. My tip is to add the Italian spice to the water , oil and salt. Plate and add Parmesan cheese to serve. Voila very easy summer dish! Let’s go spend the day at Gaylord Palms. You have heard of the Gaylord Opryland in Nashville right? this is the same hotel chain that connotes luxury and fun. What makes this resort different from others in Florida it’s the amazing atrium, the lush tropical designs, and the recreation of Florida landmarks from the San Marco Castillo to the Everglades. This was build to resemble a turn of the century mansion similar to the one in Sarasota I forgot the name, the Ringling Circus mansion. It has a 4 1/2 acres garden that will keep you busy aahha and oooohing over. It does house real alligator which they have a feeding ceremony you can watch, similar to the Peabody ducks parade. Gaylord palm offers everything from the little one to the adult, fine dining and casual dining, coffee shop, shopping, the best part it’s only 1 mile away from Disney. Now how many hotels do you know have actual street signs which I will show you later. This going to be a 2 part posting due to the amount of pictures I took. This resort is only 35 mtes away from my house, however when I come here it’s an all day affair there’s so much to do and see, or if you are like me, this is a getaway to do nothing for the day. I got this pic from their site, I couldn’t get a good one that wasn’t blurry. I still have 200 pics left it might be a 3 part post instead. Let me know what your fav hotel or resort is?